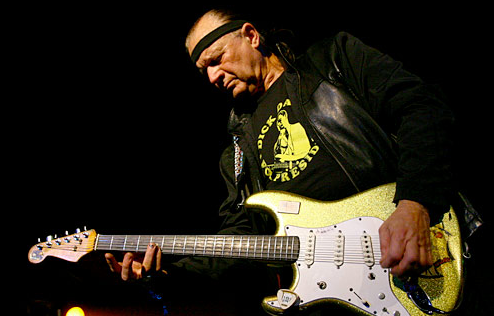 The acknowledged inventor and master of the Surf Guitar style, the left handed Dale started by taking a right handed Stratocaster and flipping it upside down without reversing the strings. The thinnest E string would be at the top of the neck and the thick E would be at the bottom. This helped with his rapid up/down picking style. Ultimately, Leo Fender designed a left handed guitar for him, painted in gold chartreuse sparkle, which he still strung in reverse. Dale had what he called a “surf switch” added to the middle of the pick guard. This switch turned the neck and bridge pickups on. In addition, he could have each of the 3 pickups on individually, or the neck and middle pickups on together. He also eliminated the tone control circuit from his Strat. Dale entirely removed the vibrato bar from the guitar, since he never used the unit, although heavy vibrato action is usually considered to be a definitive part of the surf guitar sound.